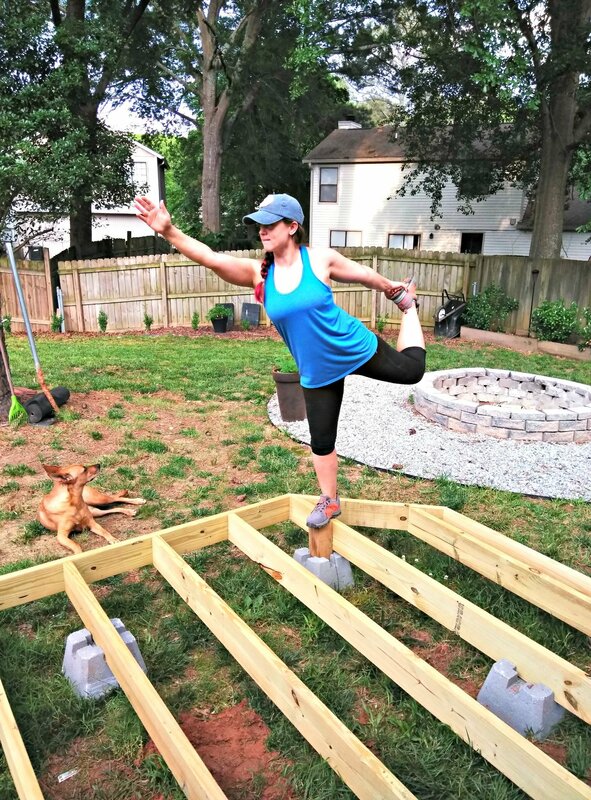 I’m building a floating deck in my back yard! This is the very first post of this series, but you will be able to catch the whole thing, start to finish, right here. Hey there! This post (or post series, rather) has been a long time coming. 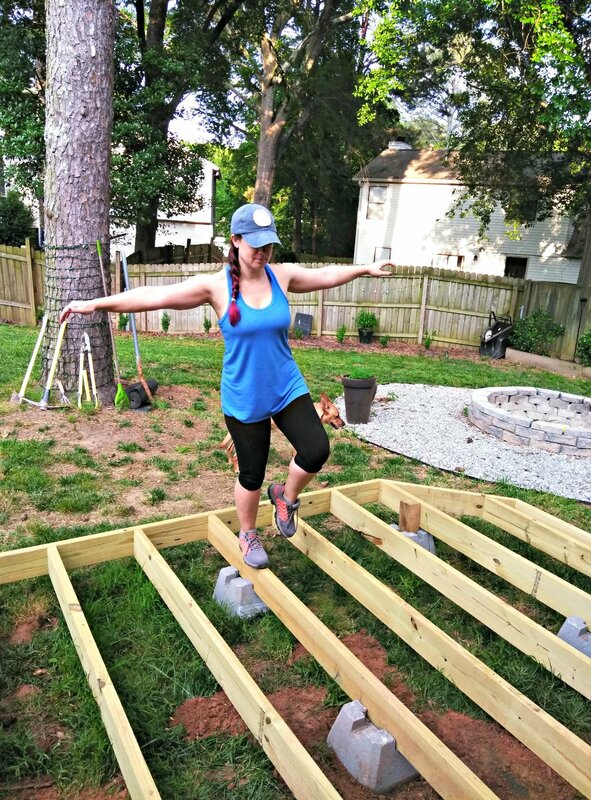 I’ve gotten started on my new floating deck (also sometimes called a freestanding deck), and I’m so excited to see this one finished! I want to first walk you through some of the decision-making details before I jump into the build. So, this post is going to cover a lot of topics regarding research, budgeting, and design. With that in mind, bear with me as we go through. My main goal is to help clear the fog on the where/what/why, and a lot of these decisions are unique challenges of my yard (sloping, building over/around a concrete patio, etc.). If you wind up having questions as I go, I’ll try address them in future posts! Legal disclaimer stuff: this is a personal recap and what I learn as I work on projects in my home. In hindsight, I often think of how I could have done something better. By no means is it a comprehensive guide for every scenario. No two houses are alike, and building codes/permitting rules vary. You will still need to research and make the best possible decision for your own home. I’m not a licensed professional. Reading and using any and all information is at your own risk. Power tools are dangerous and can kill you. Use protective safety gear, always. Don’t feed your dog chocolate, don’t stick keys in the electrical socket, and so on. If you’ve been following along for a while, then you already know a lot of this. But for those that don’t, for the longest time with this house, I’ve been focusing a lot on the interior. I supposed that’s a pretty normal habit. We are more likely to first change the things we interact with everyday, like the kitchen, before we start fixing the part that can be more easily ignored, like the overgrown bushes in the back yard. Each year, I dedicated a little time toward making progress. Baby steps! I killed off ivy, removed a bunch of pine trees, and filled in a sinkhole. Eventually, I made cosmetic improvements (a back hedge, fire pit, corner garden, etc.). All of a sudden, late last year, things really started to click; it was time to begin the two big projects I’ve always wanted to do. As with any project, it was a matter of money, time, labor, and research. It can all seem pretty overwhelming until you get started, and I am VERY good at procrastinating when I have a lot of logical reasons to postpone at my disposal! I knew I wanted to build a shed for extra storage toward the back of my lot and began planning for that last summer (which is also underway, but that build has its own separate series). I also wanted to eventually build a floating deck off of the existing concrete slab next to the house. Originally, I thought these projects would happen in completely different timelines. But as I was planning, I managed to bring a sponsor onboard for the shed. That was a huge thing for me, since this has so many moving parts with weather/budget/etc. So, a huge thank-you to Wood Its Real for that help! I realized that, since I had been saving up for the shed and could redistribute that budget, I could basically maximize cost savings if I did both projects in one short, blazing summer of building. A lot of materials crossed over between the builds, so I could also use the new skills from one build to the next while it was still fresh in my mind. Then, I sketched up a quick version of how I thought everything would be done. This seemed like a great option if I could also somehow convince K to help me design and plan it. It would be well worth the effort, I reasoned, provided that we didn’t manage to kill each other with all the sharp power tools at our disposal (thankfully, he’s a design engineer professionally and likes power tools as much as I do, so it was an easy sell). But to do any of it, we needed an actual, proper plan. I wanted the new build to create a natural flow from the patio door to the deck, from the deck to the fire pit, and so on. This would maximize the yard for an open, entertaining feel, while still giving everything separate zones. It’s kind of a lot to fit into a single space and around the only remaining tree in the yard. Even though I removed most of the trees, I kept the central one because it makes for a natural anchor for all the new lighting that will tie everything together (patio lights make everything better!). 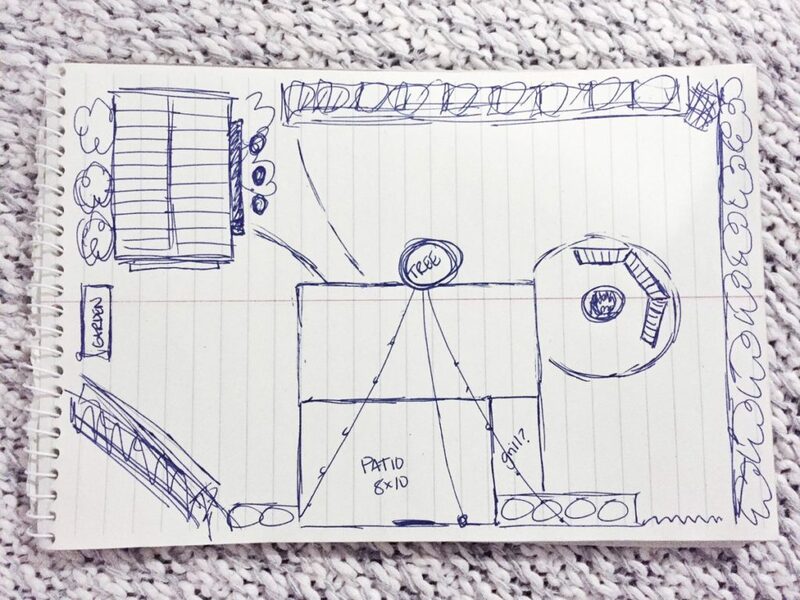 The sketch I created also mapped the new shed and room for a vegetable garden. But as I started marking things out in the yard, I realized that a patio as large as I sketched out would be WAY too big. Although this deck design doesn’t run the full length of the existing patio, I like that it sits perfectly between the patio and fire pit. The right corner of the new deck plan is at an angle, which allows for the mower to fit in between. This is a really. important. thing. for K; I won’t fight it, since I win by not having to mow. With this design, the shed/garden zone is a little more separate from the patio and deck, but still cohesive. As of 2016, my yard is filled in, but there is still a slope toward the back. I planned it this way for good reason: water runoff. The neighbor to my left is higher in elevation than all the others, so rainwater flows in a single direction in and out of my yard. If I had graded it any differently, I would risk disrupting that water flow, even jeopardizing the fill dirt by seeing it erode right back out of my yard. I planted a hedge line in the lower area as well to anticipate stemming future erosion problems, too. Patios and just about anything in the yard have a slight slope for the same reason. I confirmed this with a level on my own patio, and the right corner is the lowest spot. The plan has been to continue that same slope on the new deck. So, it won’t be perfectly level, but it also won’t be noticeable. To help build the foundation but account for leveling, sloping, etc., I did some research and found that the best (and most readily-available) fit seemed to be precast pier blocks (aka deck blocks or Handi-blocks). I also briefly considered TuffBlock (same concept, but more lightweight material). The biggest benefit with these is that it would involve less digging. The main drawbacks were that I couldn’t find many examples of TuffBlocks in use on uneven ground, and the supply would have been a special order. Since the concrete version is in stock at Home Depot and Lowe’s, I did most of my research on those before choosing them. In hindsight, I would have liked to have tried one out for the shed and one for the deck and maybe compare. I’m sure at some point, I’ll be able to test it out (with a new house or working on a friend’s, etc.). One important piece of info: since most of the new deck is touching the ground, the entire support structure (everything but the deck boards) will be made from “ground contact” lumber. 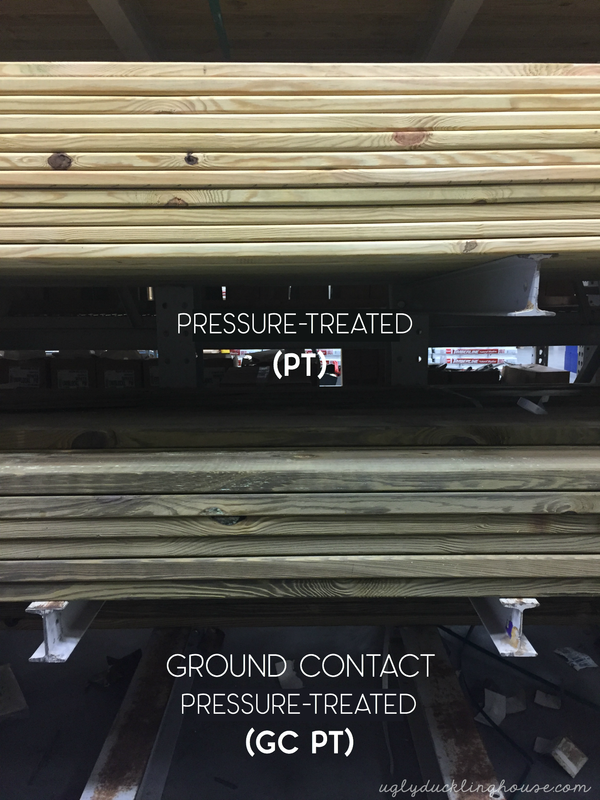 You may already know of “pressure-treated” or “PT” lumber, which is lumber that has been chemically treated to withstand outdoor conditions better than bare wood. PT lumber is recommended for just about any project exposed to the elements. Now, there is a new standard, and stores are starting to carry more and more “GC” pressure-treated lumber. My nearest Home Depot has virtually all of their stock replaced with GC; Lowe’s has about half and half. You can see a slight color difference sometimes between the two. The main difference is where you plan to use it. Here is a graphic that breaks it down depending on use (along with more details), but here’s an easy rule: if it’s anything touching the ground or within 6 inches of the ground, it should be made with ground contact lumber. If it’s exposed to more moisture, use ground contact. If it’s something that will be difficult to reach or repair: ground contact. If it’s smarter than the average bear… ground contact. I’ll cover a few more facts about GC lumber and even PT lumber in general as this series goes on, but there are so many details to cover! This is important enough to cover it in more depth, but I don’t want to throw too many details into this initial post until I can show more of the build as examples. As you can see from that digital rendering above, part of the new deck will cover a small corner of the existing patio. I found this tutorial from Family Handyman, and I plan to use some of the same ideas. Basically, I’ll be attaching some 2×4 supports to the patio (using ground contact lumber once again), and the deck will go over the whole thing. Water buildup between the concrete pad and the wood will rot wood faster, even if it’s treated. So, I plan to make raise the framework in that spot with plastic shims. Let’s see here: ground contact lumber, slope, plastic/flashing, drainage… basically every part of my plan has fighting moisture in common! So far, I’ve learned that water is my biggest concern. I may actually even be overdoing it, but I hope that regardless, the deck lasts a good long while. I checked with my local guidelines prior to starting (if you don’t find one for your city, start researching the county, and so on). By comparison to what I’ve found, my county seems to be on the less restrictive side. This is definitely a situation where your best bet is to call your permit office and ask. Regardless, I’m doing my best to build things smart and structurally sound, permit or no (the shed as well). Thank you for doing this series! You got it! I hope it makes the project look a lot easier! Timely that you are tackling this topic (well for me at least). I am currently in the beginning stages of tearing our existing deck down to the frame/joists for a full rehab. Basically, a previous owner used a gross color of deck over that is peeling terribly. Our thought was rather than killing ourselves sanding and stripping that off it would simply be easier to replace the deck boards and stain however we wanted (plus we would be able to tweak the layout as we wanted). With regards to the water management, our yard slopes back in towards our house (although not much), and it appears the same for underneath our deck. We are thinking of trying to raise the ground level around/under the deck to achieve at least a flat grade if not slightly sloped away from the house. 1. Given the age of the house/deck, I’m guessing the structural lumber is plain old PT not GC; Does this mean I should be replacing all the wood? Any compromised wood I will be replacing of course (normal rot test with a screwdriver). 2. For under the deck, the most common approach I’ve seen is using some impermeable barrier over the ground, and pouring gravel over top of that. Any thoughts on a potentially better approach for dealing with any water underneath? I’m sure there are other questions I’ll have, but figured I’d get your opinion since it’s pretty fresh for you at this point. I think sloping away from the house is a great idea, but doing any leveling work close to the house might mean needing to get some expert help. 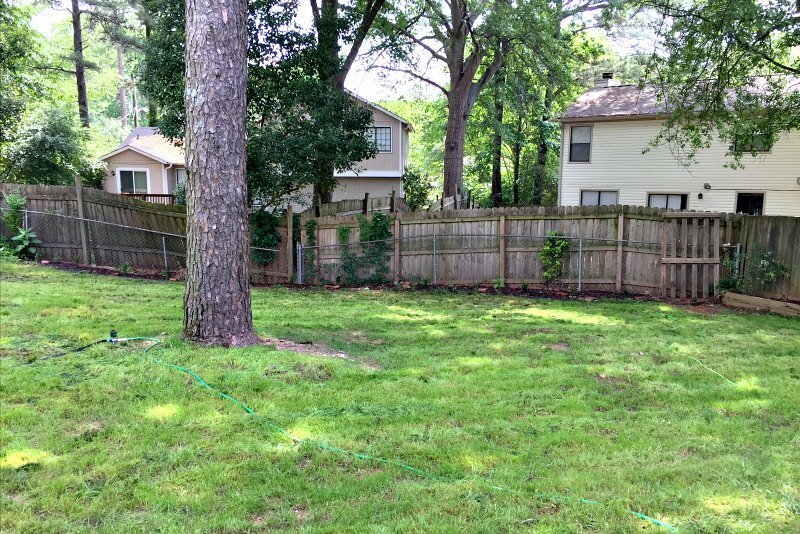 My yard already slopes away from the house and the grading work I did was toward the back, but I hope you’ll still find some of those tips helpful! 1. Whether or not you need GC depends largely on how close it is to the ground and whether or not it would be difficult to replace once the structure is up. If it’s within 6 inches of the ground, definitely GC. There’s also age vs. replacing; a lot of times, if you’re replacing something, you might need to adhere to current code when replaced. If you’re leaving something in place that was code-approved before, you might not automatically have to use the new standard. Best to check with your local code office for that info. 2. I’ll cover this in a future post, but I’m putting a thin layer of gravel under mine as well. I’ll also be covering a few other tips (it just got too long to do in one post). Things like using GC lumber, sealing the end grain of the boards when putting together the frame, taping the top of the joists with flashing tape, etc. are all additional ways my research has turned up to combat future water problems. To be honest, I may even be overdoing it, but better safe than sorry! 3. I’m not a contractor of course, but I think a ledger board or attaching the deck to the house will probably require a permit. So you’ll have to contact the permit office to go over what’s specific to your area as far as requirements. You can also probably get a lot of the initial info on their website, which is what I first did (requirements could be things like moisture barriers, types of screws, length, what the materials are made out of, what thickness they have to be, etc.). I had no intention of attaching mine to my house, so I didn’t really research it too much to be able to give much info on it. But even if it’s attached to the house, I wouldn’t be surprised if the main issue is whether or not it’s self-supporting (some decks attach to the house but have additional support underneath the house right where the deck and house meet, so even though it attaches, the weight isn’t relying on the house in any way). Regardless, I think in my area, attaching it to the house, supported or not, requires a permit. I’ll definitely have more soon! Literally working on some of it tonight and I hope we can start the decking over the weekend. Thanks Sarah! That helps a lot, and you’ve confirmed much of what I have seen in my research. Looking forward to the rest of the posts! Thanks for this series, plan to build small deck-like steps down my backyard hill, so I can follow the land and a water feature. The concept looks good so will measure and make plans. Usually, have my brother to help but this is going to be my first attempt at DYS. Hopefully, this will lead to building a shed which I really need!!! Thanks for the help!!! I built the frame myself and had help for part of the leveling. I think this is 100% a project someone can do by themselves. It may take some patience, but doable! Haha my yoga form could use some work, but thank you! Thanks! It definitely took some planning, but I’m so excited to see it DONE! Literally going to the store after replying so I can get the last of the supplies I think I’ll need to finish before the decking goes on. Keep it up! Great job! 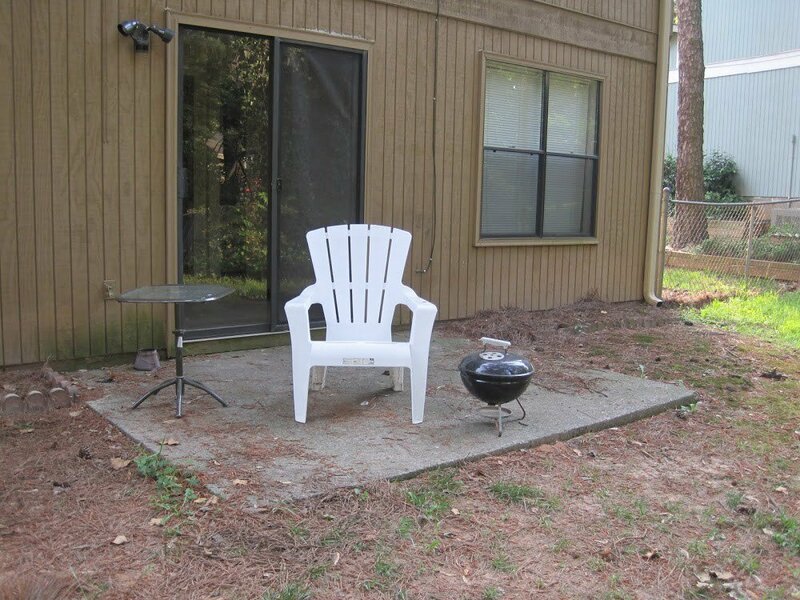 I did a whole backyard makeover on our beach bungalow a few years back. Phew, it’s a lot of work but it’s so worth it. Can’t wait to see the rest. Thank you for your encouraging words, Wendi! I did not use nails. Items I did use are listed in the materials list in the post itself for easy reference. But as for max weight load, I’m not sure and I’d look to the manufacturer. In my opinion, it’s best to err on the side of caution and build things for a heavier weight than you’ll probably ever need. Thank you for this great step by step. We are planning a large 20’x20′ floating deck and I can’t seem to find any info regarding the max distance apart the cement decking blocks and joists can be? Usually, it’s listed by the manufacturer of the ones you purchase. I can’t recall off the top of my head on the distance we used but I would first turn to a manufacturer on YouTube (I remember looking at them myself before I began planning).